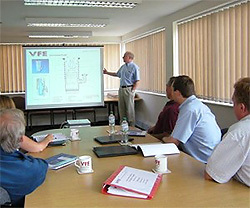 VFE’s training courses are tailored to the individual needs of each client, taking into consideration the specific abilities, knowledge and functionality of the staff. Our training complies with the requirements of NADCAP, AMS2750 E, RPS 953 & ISO 9001 : 2008 and when combined with an overall programme a VFE training course can lead to an NVQ qualification. Courses can be run at our facilities in the West Midlands of at a customer’s own premises.